Jan 19, 2019; Syracuse, NY, USA; Syracuse Orange guard Buddy Boeheim (35) looks to drive against Pittsburgh Panthers guard Trey McGowens (2) during the first half of the Orange's 74-63 win over Pitt at the Carrier Dome. Mandatory Photo Credit: Kicia Sears, The Juice Online. It was a game of runs as both teams got hot throughout the contest, the most noteworthy being Syracuse’s 22-4 run that gave it a 50-31 lead with 9:4 to go. While the lead was never really in doubt in the final ten minutes, the Orange did struggle from the free throw line, going 12 for 23, an abysmal 52 percent. Paschal Chukwu was one of the chief offenders, missing five free throws in the second half, including the front end of a one-and-one with just under eight minutes. Tyus Battle had a game-high 22, but uncharacteristically missed a pair of free throws late in the second half, as well. This was a much needed win for Syracuse, as every game matters in ACC play. This easily could have been a trap game for the Orange coming off the drama filled win over No. 1 Duke on Monday. Pitt endured one of the worst seasons in its history last year, going winless in ACC play. Though the Panthers have already won two ACC game this season, it still hasn’t won a conference game on the road since 2016. 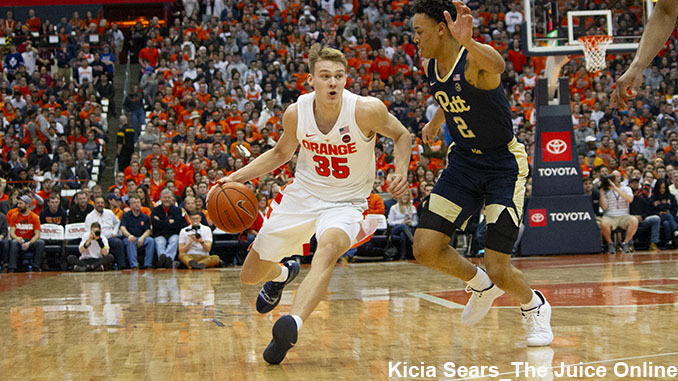 The hangover showed, as Syracuse looked sluggish on offense in the first half shooting just 36 percent. “We made a couple of mistakes and they capitalized right away,” Boeheim said. After some adjustments at halftime, Syracuse came out in the second shooting 58 percent. The younger Boeheim went 4-5 from downtown, one them forcing Pitt to switch out of its zone defense in the first half. It had been a difficult start to the season for Buddy, who shot just 2 for his first 18 from 3. But he’s started to find confidence in his stroke recently, shooting 8-14 in his last three games from distance. Buddy played extended minutes in place of point guard Jalen Carey, who was kept out of the lineup. Boeheim went with Battle at point guard for large stretches of the game, allowing Buddy to play 19 minutes, the second most minutes he’s received in ACC play. He’s now up to 30.1 percent shooting from downtown.